Upstate New York during the 2008 Presidential election, Norwegian detective Sigrid Odegard arrives in a small town looking for her missing brother. He has every reason for not wanting to be found since he is caught up in the tensions surrounding a police shooting and the mysterious death of an African-American academic. Sigrid must navigate the minefield of local and national politics to untangle what, if any, role her brother played in an incident that could tear the community apart. The ‘fish out of water’ is an evergreen trope in crime fiction, setting up no end of cultural clashes to drive the plot along. This clever, sometimes funny and often touching novel takes a familiar theme and uses it to play an interestingly fresh tune. 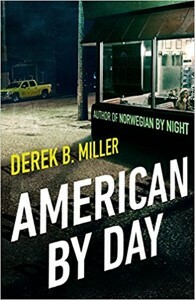 Miller takes the conventions of American crime writing, from the big city cop trying to negotiate small town life to the manhunt in the trackless wilderness and turns them on their head, often in the name of satire. Behind the humour is a clear- eyed appraisal of some of the silly and occasionally sinister foibles of American life. These include the idea that having more of everything is a kind of freedom and the unhealed scars of racism that are opened every time a police officer with an itchy trigger finger overreacts to a situation with disastrous consequences. Miller’s prose style is elegant with a turn of phrase that has echoes of Chandler, this reviewer can’t help but warm to a writer who describes someone walking with ‘the swagger of a man who had won a prize for building something in his garage using a spot welder’. For all the needle sharp one liners dispensed by his characters Miller never loses sight of their troubled humanity and even offers, most of them, a shot at redemption. This is the sort of smart crime writing that engages with puzzles, wider than those that begin and end with a body and proves the genre has no need to seek backdoor legitimacy by hoping for admission to the literary canon. At its best it is more than capable of walking tall on its own merits.